I “discovered” Candy Crush Saga developed by King on a random trip to the App Store. Cute candies, a spree of connecting 3s and 4s and 5s, watching striped candies thaw rows of frosties and the colour bombs wreck delicious havoc… a temporary but fun fad, right? With side effects of a mild sugar rush for the sugar crushed. There was nothing temporary about this fad. It’s still ongoing. I guess the kind of connect 3 game you like (diamond dash, candy crush, and the rest) says something about you. I’m a compulsive reader with a sweet tooth. Candy Crush Saga gave me mindblowing graphics of the mouth-watering candies, a cute storyline with its puppet-style appeal and surprisingly hard to crack levels! It’s also the only App where I don’t feel the need to mute the music. The music completely goes with the game, especially with the “bring the ingredients to the bottom” levels where the tune/beats remind me of a quirky but mellow Chef setting. In the home page, the music is very fairytale-esque with a hint of mystery! Very fitting with the presence of a candy factory, lemonade lake, bubblegum bridge, salty canyon and chocolate mountains; which you explore as you crack various puzzles and move on to successive episodes! Sounds like silly and juvenile fun? It’s really not. I was stuck in level 29 for days. With the social networking twist, I had to BEG my friends on Facebook to accept my request to let them let me cross over to the next episode post-level 35. 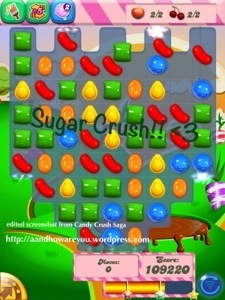 My friends then proceeded to get addicted to this impossibly sweet game! I’m in level 97 now and I have been stuck on it for quite a while. There are time bombs in this episode but the slippery chocolate is absent and not missed. I’m racking my brains to make enough candied combinations that amount to 100000 points before I’m out of moves. It’s great when I’m playing… I feel like I’m sucked into this ultimate candy factory. I can almost taste the lemon drop! I guess it’s a good thing that after your 5 lives are out, there’s a 30 minute wait before you can play again (unless you prefer to pay real $$s or hammer your friends with more requests to send you an extra life). It’s mildly frustrating but it keeps you from playing every minute of the day. A sickeningly compulsive need to be liked. I miss you, practiced nonchalance. You used to feel so good.